The fourth annual Children’s Hospital Los Angeles Make March Matter fundraising campaign raised nearly $2 million, the hospital announced Wednesday. 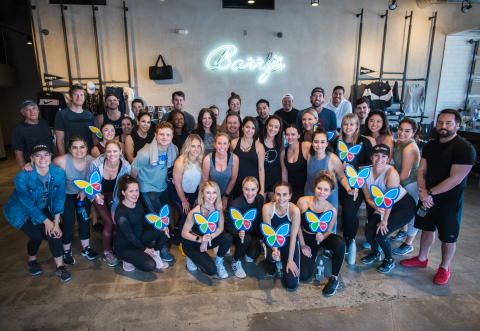 The campaign exceeded its $1 million fundraising goal thanks to partnerships with a record 123 businesses in Los Angeles and the Coachella Valley that rallied community participation to support critical, lifesaving care for children in Los Angeles and the Coachella Valley. Numerous promotions and a record 47 events in 31 days highlighted this year’s campaign including: shopping events and promotions at boutique retailers like Jonathan Simkhai, Theory, Kendra Scott, Miron Crosby, and many more; dining events at restaurants and coffee shops like IHOP, Panda Express, Alfred Coffee, California Pizza Kitchen, Shake Shack Spencer’s Restaurant, and more; CHLA-themed fitness classes at Cycle House in Studio City and Barry’s Bootcamp in Los Angeles, and World Gym in Palm Desert. Porto’s Bakery & Café baked and sold more than 19,000 special CHLA-themed butterfly sugar cookies in March and donated a portion of the proceeds to the campaign. Moose Toys made a $200,000 gift to the campaign, teen fashion designer Grace Rose hosted a pop-up shop at The Americana at Brand and donated a portion of sales from her Rosie G clothing line, and the Los Angeles Kings hosted a special CHLA-themed game at Staples Center. In the Coachella Valley, The H.N. and Frances C. Berger Foundation gave a $100,000 matching grant and thanks to the generosity of all the campaign’s business partners in the area as well as the Galen Family Foundation, the valley-specific initiative nearly reached its goal of $250,000. Funds raised in the desert communities will go towards the Barbara Sinatra Children’s Center (BSCC), which is overseen by Karen Kay Imagawa, MD, Director of the Audrey Hepburn CARES Center at CHLA. The CARES Center and the BSCC collectively treat more than 1,200 children each year, focusing on the needs of children suffering the effects of abuse and neglect and those who are at risk of being abused. Additional funding will allow patients to receive child-appropriate care more quickly, reduce delays in child abuse investigations, protect more children who have suffered abuse and support a more streamlined return home for children who have not been abused. For the fourth consecutive year, Panda Express earned top campaign contributor honors by raising $400,000. Celebrities who supported CHLA throughout March include Chris Pine, Natalie Portman, Rachel Zoe, Justin Turner, Katherine Schwarzenegger, Victoria Arlen, Malin Akerman, Teddi Mellencamp, Charlotte McKinney, Kaia Gerber, Rowan Blanchard, Skai Jackson, Megan Henderson, the KOST 103.5 Ellen K Morning Show team, Becca Tobin and the LadyGang, Cara Santana and the Los Angeles Chargers football team. Make March Matter was created by CHLA in 2016 as a way to identify a time of year devoted specifically to children’s hospitals and children’s health. The month of March was selected as it signifies the start of spring. And with the new season comes a feeling of hope, new beginnings, and life. In 2018 Children’s National Health System in Washington, DC joined the movement by launching its own Make March Matter campaign patterned after CHLA’s initiative. “The hope is that more children’s hospitals across the country will be inspired to unite with their communities and host their own Make March Matter campaigns,” says Carter. Make March Matter is an annual fundraising campaign that builds awareness and support for children’s health across Southern California. The campaign supports Children’s Hospital Los Angeles—a nonprofit pediatric academic medical center dedicated to offering more than 350 specialty programs and services to help the health of children. The goal of the campaign is to raise money in support of Children’s Hospital Los Angeles to ensure that all of its pediatric patients receive the critical lifesaving care they need.